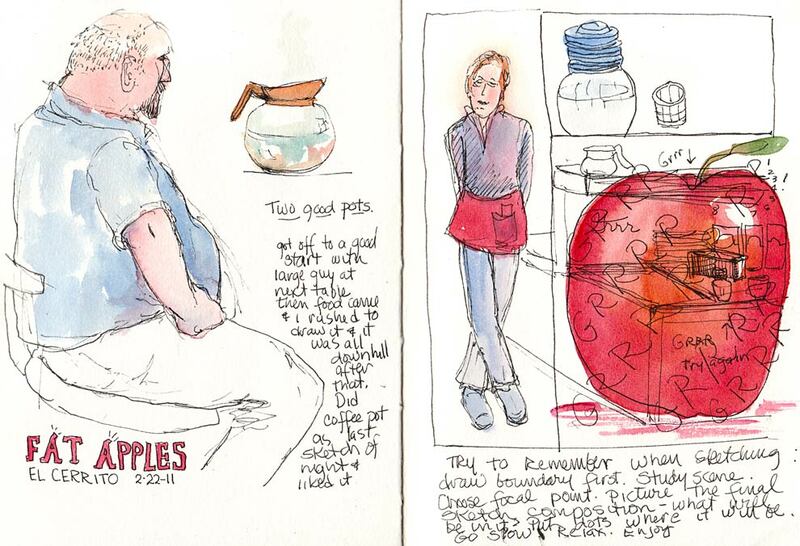 My favorite two sketches the night we met to sketch at Fat Apples Restaurant in El Cerrito were the two “pots” on the left hand page above. The guy was the first thing I drew, the coffee pot the last. I wasn’t in great shape, having had little sleep the night before. I just couldn’t get into the drawing zone, turn off the inner critic or relax into seeing, drawing, and enjoying the adventure. Underneath the watercolor apple above are lots of messed up lines and the word “Grrrr” written all over the things that frustrated me. The waitress on the right kept returning to her spot and standing in exactly the same position each time and the counter beside her was even more stationary but I just couldn’t draw it. When I added m ore watercolor at home to the BLT (left page above) I must have closed the book too soon because the pages glued themselves together. When I tried to separate the pages, part of my sandwich stuck to the other side. Not only did that ruin the sandwich but also a small ink drawing I’d liked on the other page. 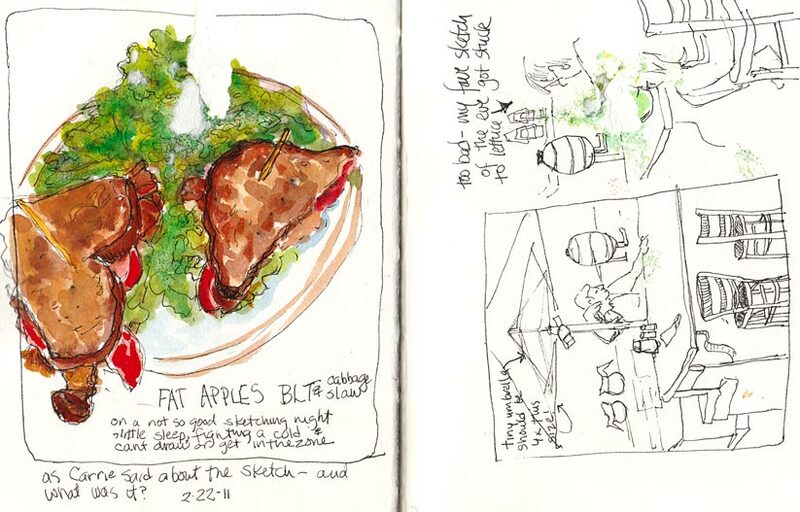 I’d repainted the sandwich because when we showed our sketches at the end of the evening and I said it was my dinner, one of the sketchers innocently asked “what was it?” And she was right — it was so loosely drawn and painted that it wasn’t recognizable as a sandwich. I forgot to mention this. I wrote about what you are talking about above-being frustrated-and made a little sketch to celebrate it. If you can, check it out (I made a badge for it). re: it was so loosely drawn and painted that it wasn’t recognizable as a sandwich. I think frustration is a part of sketching . . .well, it is for me anyway!! I appreciate your willingness to share your frustration, show what you had difficulty with, and tell us what you were dissatisfied with is so valuable to me. The ability to just let a drawing be what it is and move on to the next is something I’m working on. Thank you! Thank you for sharing your sketching off days, along with the good ones! I certainly can relate to that and am glad to hear someone with your skills as an artist still has those days! Oh my what a trying night. I love your 2 pots, the man & coffee pot are just perfect, as is the sandwich V2. A very nice light-hearted tale of over-coming frustration! The sandwich looks yummy.